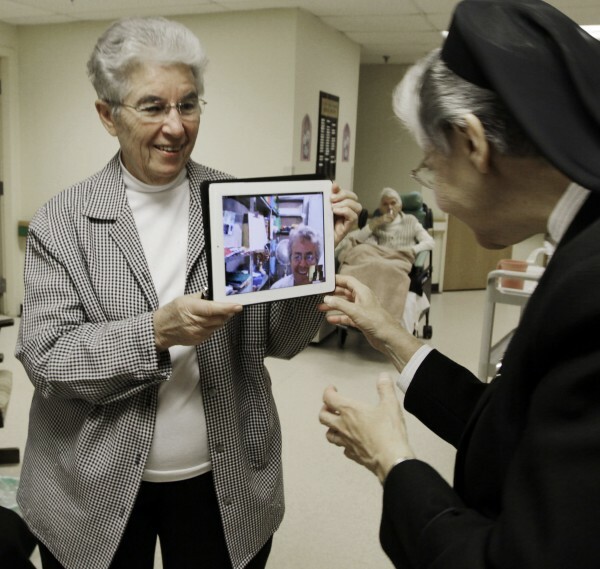 Sister Priscille Roy (left) holds an iPad displaying her colleague, Sister Pauline Demers, who is in Brazil, to show Sister Elaine Lachance (right) at St. Joseph Convent in Biddeford on Tuesday, April, 10, 2012. Good Shepherd Sisters of Quebec has just six convents in Maine and Massachusetts with fewer than 60 sisters. Sister Lachance is using the Internet, social media and a blog to attract women who feel the calling to serve God. 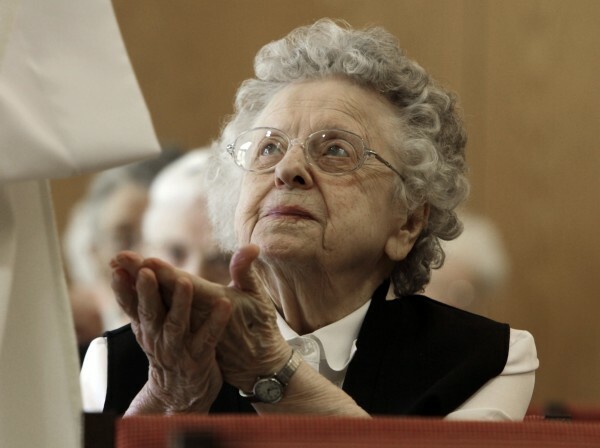 Sister Bertha Duperry, 96, reaches out to take communion during Mass at St. Joseph Convent n Biddeford on Tuesday, April, 10, 2012. Sister Elaine Lachance works at a computer displaying a photo from the St. Joseph convent in Biddeford on Tuesday, April, 10, 2012. Good Shepherd Sisters of Quebec has just six convents in Maine and Massachusetts with fewer than 60 sisters. Sister Lachance is using the Internet, social media and a blog to attract women who feel the calling to serve God. BIDDEFORD, Maine — When Sister Elaine Lachance devoted herself to a religious life straight out of high school in 1959, her religious order had more than a dozen convents in the U.S. with nearly 260 sisters. Today, the Good Shepherd Sisters of Quebec, based in Canada, has just five convents in Maine and Massachusetts with 56 sisters. The youngest is 64 years old, and it has been more than 20 years since a new member joined. Rather than leave the future of the convents to prayer and chance, Lachance has turned to the Internet. She is using social media and blogging to attract women who feel the calling to serve God and their community. She says she had her awkward moments when she began using Facebook and writing blog posts. The number of nuns and sisters has plunged through the decades as more career opportunities for women opened, parochial schools closed and sisterhood became less visible. Generally, a nun lives a cloistered, contemplative life in a monastery, while sisters live and work within their communities. In the U.S., the count has fallen from about 180,000 in 1965 to 55,000 last year, a drop of nearly 70 percent, according to the Center for Applied Research in the Apostolate. In 2009, their median age was 73, with 91 percent of them 60 and older. At one time, women would join the sisterhood through word of mouth or their personal interactions with sisters, said Lachance, vocation director for the Good Shepherd Sisters. But now, many younger women aren’t even aware it’s a choice. For years, Lachance has visited Catholic schools, placed ads in religious publications and attended job fairs to recruit sisters. She’s still doing those things, but she has also turned to Facebook, her blog and YouTube. The order also updated its website and hired a public relations company. It’s hard to sell somebody on committing to a religious life, with its vows of poverty, chastity and obedience, in today’s world of slick technology, fast cash and material goods, Sister Dorina Chasse said on a recent day at St. Joseph Convent, a home along the Saco River in Biddeford where elderly and sick sisters are taken care of. “It’s hard for them to leave that,” Chasse said. Still, there’s been an uptick among women showing an interest in pursuing a religious life, said Patrice Tuohy of the National Religious Vocation Council, a Chicago-based group representing vocation directors for religious organizations. The council launched a website called VocationMatch.com seven years ago that links young people interested in leading religious lives to religious communities. The site gets about 6,000 inquiries a year. The Internet is useful for such questions because it offers instant information and is anonymous, Tuohy said. The Internet has made a huge difference in how religious communities are recruiting, Tuohy said. Besides websites and Facebook pages, some are using podcasts, YouTube videos and chat rooms. According to a 2009 study commissioned by the National Religious Vocation Council, 87 percent of religious institutes had used the Internet for vocation promotion in the past five years. Audra Turnbull, 23, turned to the Internet when she felt the calling in college. Inside the chapel at Quincy University in Quincy, Ill., she pulled out her laptop, Googled “nuns” and found a website called A Nun’s Life. 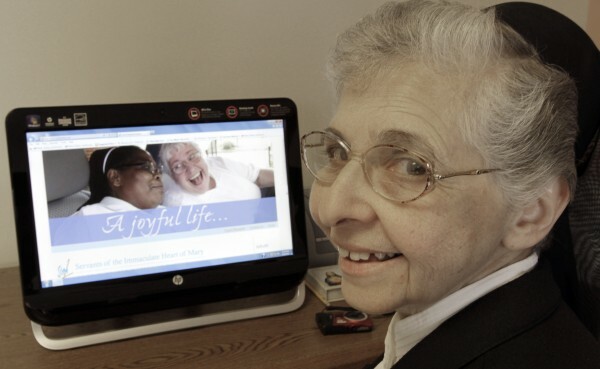 In time, she checked out dozens of other websites, YouTube videos and social media before getting in touch with a motherhouse in Monroe, Mich., where she plans to join the ministry. Those tools are invaluable for “nunnabes” — wannabe nuns — like her, she said. Turnbull expects to become a sister in two to three years. She has also created a blog of her own called The Awkward Catholic, which takes readers through the process of entering a religious life. For Lachance, she’s aiming to use the Internet to spread the word about religious opportunities and what religious life is like. In the case of the Good Shepherd Sisters, the sisters work with women in distress, including women in prison or leaving it, pregnant single women, single mothers and women with substance abuse problems. They work at schools, food pantries and elsewhere in the community, recognizable through their white blouses, black skirts and vests, and black headdresses with veils. But sisters also have interests and hobbies just like anybody else. Lachance is partial to Wii baseball and bowling video games, and she and her fellow sisters are big sports fans. “On Super Bowl Sunday, we were watching with our pizza,” she said. Results have been slow, with only 10 people liking the Good Shepherd Sisters’ Facebook page. But Lachance remains optimistic, as does Peggy Spino, her administrative assistant. Some religious communities have just given up trying to attract new blood, said Spino.